Much like the iconic landscapes of Yosemite and Yellowstone, Bryce has become its own photographic cliché. This photograph was made in 1994 on my first trip out with the prototype scanning camera. My assistant Darin Steinberg was along to help out. People have gravitated to this photograph over the years and I've resisted, continuing to think that it is so hard to photograph Bryce's remarkable landforms in a unique way. Nonetheless, this photograph did move my vision forward in thinking about subtle renditions of wild forms, and what may have been the first dramatic example of the scanning camera's ability to record tonal transitions into shadows with open detail and no overt blue shift. I do keep returning to it and was very impressed with the reality of the image. We're offering an 11x14 inch print, matted to 16x20 and ready to frame for $195, framed for an additional $75. This print at this price is offered through September 30. We'll be taking orders until then, and shipping them out by October 15th. Each month we offer a signed, original print, at a special price. This is a great opportunity to own a very affordable fine-art photograph. Orders are taken for a 30-day period, then printed and shipped within two weeks after the close. When it's over, it's over. These prints won't be available again at this price. with Steve on a wide range of issues. We'll have plenty of time to work on everything from the technical and aesthetic challenges of composing and capturing meaningful images to overcoming the hurdles involved in producing great prints. Where possible, The Magical Digital Bus (http://www.sjphoto.com/ Southwest/ebus.html) provides us with the hands-on tools to work with our images, review our day's work, and produce fine-art prints. Temporary labs will be set up off-shore. Thursday, October 21st. 1-3 p.m.
Friday, October 22nd. 9-12 p.m.
Saturday, October 23rd. 1-3 p.m.
space. We are very excited about a expanded space for galleries, work and workshops. Once the move is complete there will be a retrospective show of black and white work, featuring all new digital prints of many silver based images and an extensive body of all digital landscapes. * The Studio and Gallery is Moving! More news about the new space in October's Newsletter. We will be open our normal hours at our current space through September 26. This work traces the evolution of digital imaging from publishing to space exploration, explains the technology underlying the digital photo revolution, explores a personal history of involvement and influence, and uses the pages to suggest pathways through what Stephen considers the core of Photoshop for photographers in transition and rebirth into the digital realm. 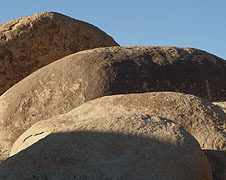 His personal insights, workflows and encouragement are central to this work, but the concentration on digital photography as photography and not computer science or trickery, makes this work pivotal. The sections on aesthetics, composition and ethics take stands and make concrete suggestions that are welcome in this age of anything goes and the assault on photographic truth. 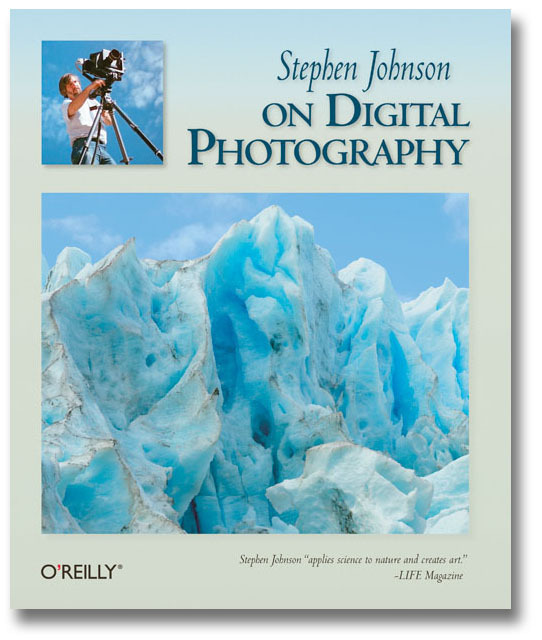 Steve Johnson, one of the true visionaries of the digital photography era, offers us a technical tour de force and passionate artistic overview of the possibilities inherent in this new medium. On Digital Photography should be required reading for every aspiring photographic artist. 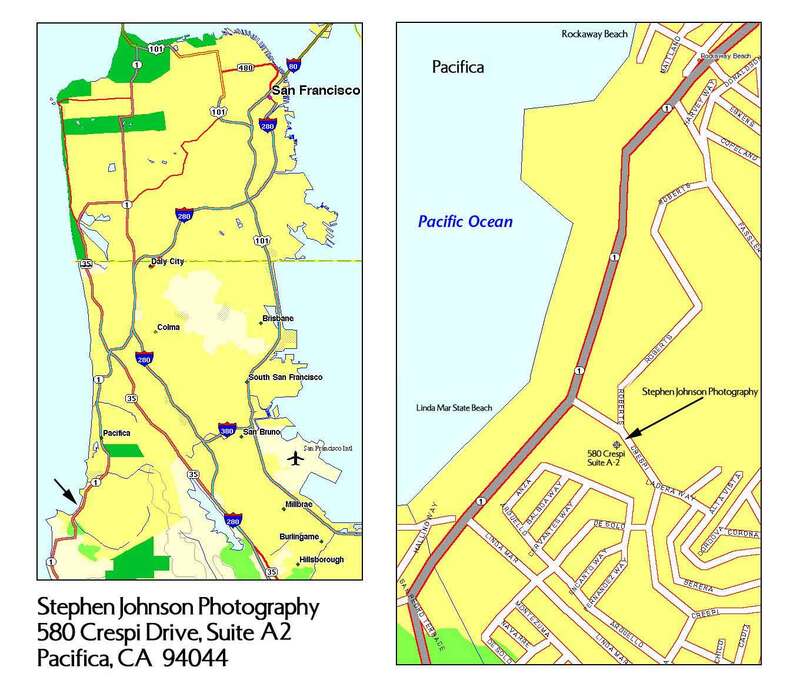 excerpted from: "Stephen Johnson On Digital Photography"
Our photographic desires are limited by many constraints. The photographic constraints to record what is in front of the lens is a fundamental aspect of what makes photography a wondrous medium. But the technical issues like optical behavior and recording medium limitations are areas where we are always working to make photography better. Innovative combinations of different versions of photographs are now more possible in this digital age because of digital editing software and potentially precise registration between images. Depth of Field expansion is one of those areas of possibility. In situations with stationary subject matter where a small aperture is not practical or possible, you can combine more than one version of a scene into a finished image that bypasses traditional optical limitations. 1. Using a tripod, make a series photographs encompassing the depth of field you want to record. Allow for some focus overlap between shots to build smooth transitions between them. This can be accomplished through changing the focus or the aperture and focus. Keep in mind that different focusing points within an image will also scale an image which can make reintegrating a challenge. 2. Assembling these images together is not easy. Open your base file and paste all others into layers stacked above background layer. For the purposes of this procedure, I’ll use a two image integration as the example. 3. Erase the out of focus areas of the image on top of your base file to see through to the in-focus areas below. This commonly might done by erasing an out of focus foreground in the second shot because you refocused the lens to sharpen an out of focus background. This should be done with a soft-edge brush, with many history states set in Preferences, and careful inspection as you go. 4. Save the Layered file and both of your originals for later use depending on what flaws you may see in the image after looking at it for awhile. 5. Flatten the file when finished. We're happy to mail you a copy of our product catalog, just send a note to michelle@sjphoto.com or call us at the number below.